Felling a large dead oak. 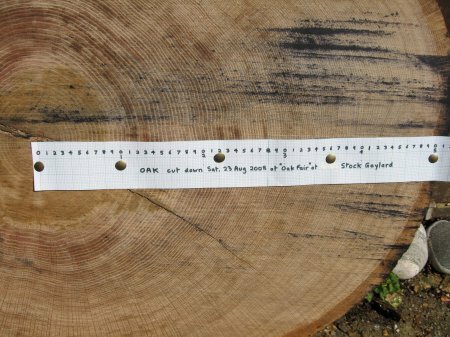 R1112 Red oak, Quercus rubra, planted 1850.
all the way down the trunk"
Height 31 m, Girth 2.87 m, felled 23 Aug 2008. 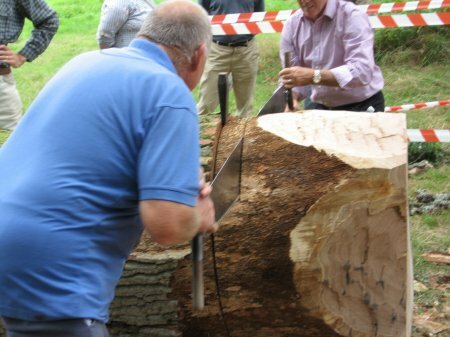 A celebration of the life and death of an oak tree in England. R1116 The cut stump. Saw work gives very smooth surface, axe work none. Chain-saw surface would be poor. Blue marks of wedge to open saw cut, cup of tea essential. 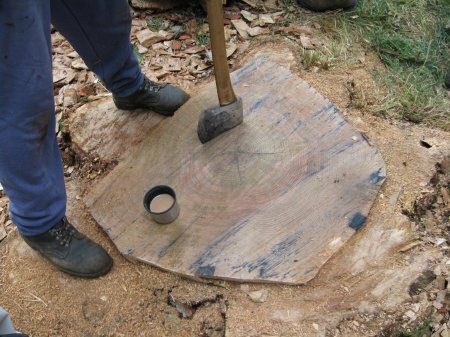 The outer half of the cross-section was cut by by axe, the smooth central area by two-man crosscut saw. Wedges were placed to steer the falling tree. 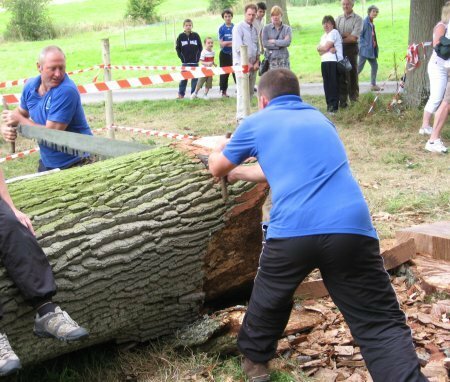 The long straight edge by the axeman's left foot shows the hinge when the oak finally fell, steered exactly. R1117 Cutting a 12 foot length with a two-man saw. The cut is kept open with a hammered wedge. Saw teeth need to be sharp, work gets harder nearer the ground. Teeth on the 2-man crosscut saw. R1157 .....with plain saw teeth, 9 teeth in 13 cms. R1120 Cutting a Salami-slice for the author. The art is keeping the two cuts 8 cms apart, parallel, and open with a wedge. The saw must cut right across the trunk. R1121 The salami-slice ready for close-up photography of the rings. The saw cut is very smooth. A band of marked-up graph paper is pinned to a radius for reference. 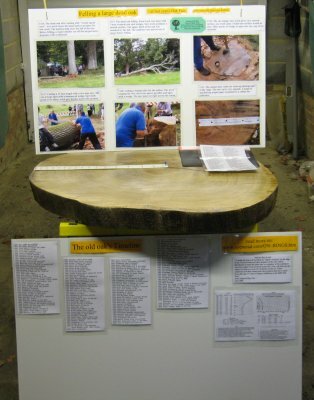 A display of the oak slice and its rings has been prepared for the next Oak Fair in 2009. The varnished slice rests on two saw horses which can stand on grass or hard flooring. Two men are required to move the 43 kg slice safely. Mounted laminated photos and text contain most that is on this webpage. A radius tape allows dating each ring and a handbook gives a complete Timeline. The slice is very pleasant to the touch, and the clear rings are a delight to see. The complete display can be brought by car and is available free for environmental meetings. 1.5 m high x 1.0 m wide x 1.0 m deep. Quercus rubra (syn. Quercus borealis), is an oak in the red oak group (Quercus section Lobatae). It is a native of North America, in the northeastern United States and southeast Canada. It grows from the north end of the Great Lakes, east to Nova Scotia, south as far as Georgia and states with good soil that is slightly acidic. Often simply called "Red Oak", northern red oak is formally so named to distinguish it from southern red oak (Q. falcata), also known as the Spanish oak. Description In forests, the northern red oak grows straight and tall, to 35 m (115 ft), exceptionally to 43 m (140 ft) tall, with a trunk of up to 1 m (3 ft) diameter; open-grown trees do not get so tall, but can develop a stouter trunk, up to 2 m (6 ft) in diameter. It has stout branches growing at right angles to the stem, forming a narrow round-topped head. It grows rapidly and is tolerant of many soils and varied situations, although it prefers the glacial drift and well-drained borders of streams. Detail of mature bark A 10-year-old tree will be about 5 m (15 ft) tall. Northern red oak is easy to recognize by its bark, which features bark ridges that appear to have shiny stripes down the center. A few other oaks have bark with this kind of appearance in the upper tree, but the northern red oak is the only tree with the striping all the way down the trunk. Bark: Dark reddish gray brown, with broad, thin, rounded ridges, scaly. On young trees and large stems, smooth and light gray. Rich in tannic acid. Branchlets slender, at first bright green, shining, then dark red, finally dark brown. Bark is brownish gray, becoming dark brown on old trees. Wood: Pale reddish brown herpes, sapwood darker, heavy, hard, strong, coarse-grained. Checks in drying, but when carefully treated could be successfully used for furniture. Also used in construction and for interior finish of houses. Sp. gr., 0.6621; weight of cu. ft., 41.25 lbs. Winter buds: Dark chestnut brown, ovate, acute, one-fourth of an inch long. Leaves: Alternate, seven to nine-lobed, oblong-ovate to oblong, five to ten inches long, four to six inches broad; seven to eleven lobes tapering gradually from broad bases, acute, and usually repandly dentate and terminating with long bristle-pointed teeth; the second pair of lobes from apex are largest; midrib and primary veins conspicuous. Lobes are less deeply cut than most other oaks of the red oak group (except for black oak which can be similar). Leaves emerge from the bud convolute, pink, covered with soft silky down above, coated with thick white tomentum below. When full grown are dark green and smooth, sometimes shining above, yellow green, smooth or hairy on the axils of the veins below. In autumn they turn a rich red, sometimes brown. Often the petiole and midvein are a rich red color in midsummer and early autumn, though this is not true of all red oaks. Petioles are stout, one to two inches long, often red; stipules caducous. Flowers: May, when leaves are half grown. Staminate aments four to five inches long, hairy. Calyx four to five-lobed, greenish; stamens four to five; filaments slender; anthers yellow. Pistillate flowers borne on short peduncles; involucral scales broadly ovate, dark reddish-brown; stigmas elongated, bright green. Acorns: Ripen in the spring of the second year, about 18 months after pollination; solitary or in pairs, sessile or stalked; nut oblong-ovoid with broad flat base, full, with acute apex, one half to one and one-fourth of an inch long, first green, maturing nut-brown; cup, saucer-shaped and shallow, 2cm (0.8 in) wide, usually covering only the base, sometimes one-fourth of the nut, thick, shallow, reddish brown, somewhat downy within, covered with thin imbricated reddish brown scales. Kernel white and very bitter. Despite this bitterness, they are eaten by deer, squirrels and birds. 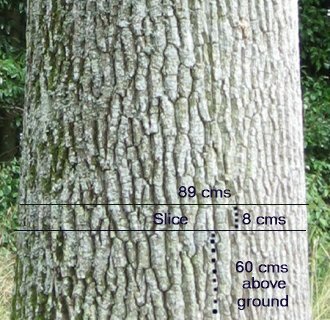 In forests, the northern red oak grows straight and tall, to 35 m (115 ft), exceptionally to 43 m (141 ft) tall, with a trunk of up to 1 m diameter; open-grown trees do not get so tall, but can develop a stouter trunk, up to 2 m (6.6 ft) in diameter. Has stout branches growing at right angles to the stem, forming a narrow round-topped head. It grows rapidly and is tolerant of many soils and varied situations although prefers the glacial drift and well-drained borders of streams. Uses The northern red oak is one of the most important oaks for timber production in North America. The wood is of high value. Other related oaks are also cut and marketed as Red Oak, although their wood is not always of as high a quality. These include black oak, scarlet oak, pin oak, shumard oak, southern red oak and other species in the red oak group. The northern red oak is widely planted and naturalized also in Central Europe. Red oak wood grain is so open that smoke can be blown through it from end-grain to end-grain on a flatsawn board. EXCEPTIONAL WEATHER suffered by this tree 1850-1895 1. 8th WETTEST in the EWP series. Thank you very much for the link, it looks really good. Its incredibly interesting to see the time line and to know what was going on at certain years of the trees life. I am very much looking forward to seeing the finished article. I wouldn't like to say for sure as I'm not a tree expert but i would identify the tree as a quercus rubra. i will have another look at the trees in the cluster and let you know if anythings different. The tree had been dieing for a few years (only producing few leaves) and had not produced any leaves for the last couple of years. I will also check this with Andrew Langmead as he might know different. I hope its all going well and see you next year.